In “my world,” Wednesdays are FFA day. It seems appropriate then that on the Wednesday of National Teacher Appreciation Week I pay tribute to my Agriculture Teacher and FFA Advisor, Miss Spencer, now known as Mrs. Lamb. 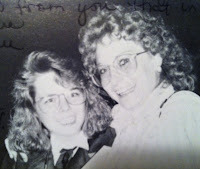 Join me on a journey through the FFA motto and the lessons she taught me. Of course, this is the primary role of a teacher, helping their students learn to do something. Ms. Spencer however made me learn to do MORE. She helped me set goals and figure our strategies to achieve them. Had to take a picture of a yearbook picture for use in today's blog, but I think this captures the excitement I had in FFA and the important role Ms. Spencer had in my life. Practice, practice, practice. That’s how you learn and that was what Ms. Spencer constantly had us doing - practicing skills and concepts so we could learn them and apply what we had learned. I remember her extreme patience as I struggled to learn to weld. (Hence, I am not an Ag Mechanics teacher) She kept making me “do” so I could learn. A favorite memory is when she drove us all around the school district in the yellow suburban to look at landscapes and identify, with both common and scientific names, the plants we were seeing so that we could be ready for the National Nursery Landscape contest. One of the three components of Agricultural Education is supervised agricultural experience (SAE). Ms. Spencer trusted me to oversee the greenhouse on weekends so I could earn credits toward FFA trips. She helped me apply for college scholarships and as a result earn funds to support my learning. She assisted me as I worked to earn FFA degrees, an important part of any FFA member’s life. More importantly, she taught me that there are things besides money they get earned and are vital to a happy life. Ms. Spencer modeled a life of service and taught her students that value of service as well. From painting buildings at the fairgrounds to maintaining a landscape at the entrance to town, providing service as an FFA member also provided me with life skills. Ms. Spencer once wrote in my yearbook. “Think about it. Agriculture Teaching really is quite a life.” She provided inspiration for my journey into agricultural education and I hope that I am able to help my students experience the FFA motto to the fullest. FFA Advisors, how are you helping your students experience the motto? FFA members, past and present, have you taken the time to reflect on lessons learned from your advisor lately? Teacher Appreciation Week is a great time to do it.